11532B, Jalan Persiaran Impian Ehsan,Taman Impian Ehsan, Balakong, 43300 Seri Kembangan, Selangor, Malaysia. Fook Lift Sdn Bhd was established since 1985 . We are pioneers in this Material Handling Equipment Industry with over 20 years of experience. 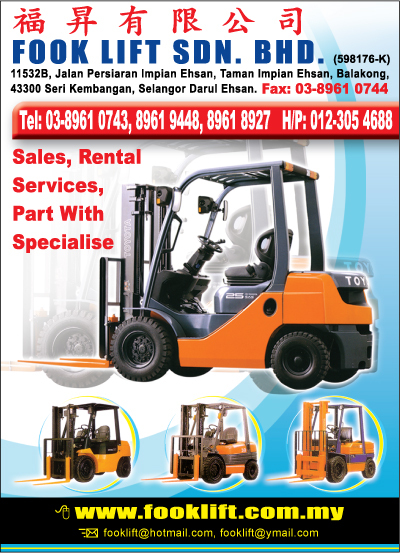 We are specialized in Sales , Rental And Maintenance of Used, Reconditioned Forklift truks . Since inception , we has been providing our customers with solutions for their material handling requirements . Such as Toyota Forklift, Mitsubishi Forklift, Komatsu Forklift and so on.